Dental crowns are an ideal way to rebuild teeth which are broken or have been weakened by decay or a very large filling. It is an artificial restoration which is custom made to fit over your remaining tooth, protecting it and restoring it to the shape and appearance of a natural tooth. Dental crowns can be used for both front and back teeth. A dental veneer is a very thin layer of porcelain which is bonded to the front of a tooth only. Veneers are only used for front teeth and less enamel is removed from the tooth compared to a crown. If you’re looking to hide significant damage to your teeth, you may need to consider dental crowns over veneers. 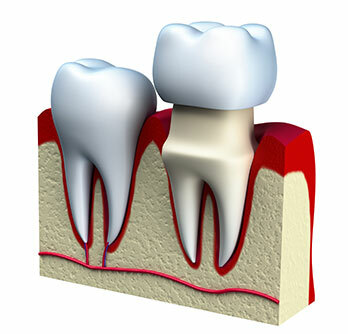 It is all about the amount of tooth structure as to which restoration is the most suitable. A dental crown covers the whole surface area of the tooth whereas the veneer only covers the front surface, but both improve the overall appearance of teeth. You may have discoloured fillings and would like to improve the appearance. If you have had a root filling which will then need a crown to protect it or if the tooth has become very discoloured. Crowns may be needed to help keep a bridge or denture firmly in place. Due to their very thin nature, veneers work best for teeth that are slightly misshapen, uneven, chipped or severely stained in a manner that cannot be rectified through whitening or other treatments. Ceramic Crowns. These cosmetic crowns are made purely of a ceramic material i.e. there is no metal present. These crowns look incredibly natural and blend in with your natural teeth. They are very strong in thin section and therefore they don’t involve a lot of tooth removal compared to other crowns. Ceramic crowns can be used for both front and back teeth. Precious metal such as gold. These metals crowns are very strong and hardwearing but are only used for the back teeth due to their colour. Porcelain bonded to metal. These crowns consist of a metal base with porcelain fused or bonded to its surface. It is a strong crown but one disadvantage is that small pieces of porcelain may chip away exposing the underlying metal and therefore ruining the aesthetics of the crown. You may also see the metal shine through at the gum margin where the porcelain is thinner in this area. These crowns also tend to be thicker so your dentist may need to remove more tooth substance. Dental veneers are most commonly made from porcelain, though many cosmetic dentists also offer composite resin as another option. Porcelain is an extremely sturdy ceramic material that can be shaped and coloured in great detail to look like a natural tooth. How are Crowns and Veneers prepared? After carrying out a full dental examination and taking necessary X-rays, your dentist will prepare the tooth or teeth for either crowns or veneers. Once the tooth has been shaped, the dentist will take an impression of the prepared tooth, as well as an impression of the opposite jaw and will also record how your top and bottom teeth meet. Photos may also be taken. Between visits, your dentist will place a provisional restoration which will be in situ for approximately 2 weeks. This will help to prevent sensitivity, allow limited function and provide a nice smile. The crown or veneer will be bonded into position using a special dental adhesive once the fit and appearance has been checked and approved by you. How long do Crowns & Veneers last? They say that crowns last on average between 7-15 years but depending on how much natural tooth is left underneath the crown, where in the mouth the crown is placed and how well the person looks after their teeth, they can last for many, many years. As veneers are thinner, they normally do not last as long as crowns. Porcelain crowns and veneers never change colour or discolour over time but your natural teeth may do and therefore the porcelain crowns and veneers may appear lighter compared to your natural teeth. If this is the case, then either teeth whitening can be used to lighten your natural teeth or the crowns/veneers can be changed and a more appropriate shade chosen. Will the Crown feel different compared to my natural teeth? The shape of the crown will be slightly different from the shape of your tooth before it was crowned and therefore you may be aware of it to begin with. After a few days however, it will feel like a natural tooth. This patient underwent a combination of Cfast braces, teeth whitening and a single veneer to achieve this fantastic result. This patient had a combination of teeth whitening, crowns and a veneer to achieve this lovely result.